It's okay, everybody: Marvel Comics has decided the 2012 election for you. And the publisher of Spider-Man and the Hulk comics has decided that their own Captain America would be a better president than Barack Obama or Mitt Romney. Steve Rogers' really short road to the White House starts in this week's Ultimates Comics Ultimates #15, where he gets the majority of votes via write-in during a special election. He then takes an oath of office next week in issue #16. On one hand, you can read this plot development as a cynical play to generate buzz in an election year. On the other hand, Marvel editorial has significantly shaken up their Ultimate Universe, a fictional construct where remixed alternate versions of their heroes live. The last few years have seen the near-destruction of New York City, deaths of major heroes and a fractured United States where mutants are hunted down and held in concentration camps. Superhero comics can be great metaphors for aspects of human nature. Such symbolism usually accrues over time, going from unintended interpretation to commonly-held belief. Mankind's fear of the other formed a vague subtext from Stan Lee and Jack Kirby's earliest X-Men comics, but it wound up turning the teams of mutant adventurers into an allegory for every group who's ever been oppressed. Captain America's a little different. He was dreamt up by Joe Simon and Jack Kirby when America was fighting against far-off tyrannies. Simon and Kirby captured the zeitgeist of World War II-era America and also tapped into something essential about the way America wants to see itself domestically and on the world stage. The puny-guy-turned-super-soldier essentially morphed into a latter-day version of Uncle Sam, without the top hat. Captain America becoming president turns a propaganda symbol into a policy-maker. This isn't the first time that a presidential storyline has popped up in Captain America. In a previous publishing run—1980's Captain America #250, to be specific—Cap mulled over a run for Commander-in-Chief but demurred after deciding he could serve the U.S. better as a symbol rather than a politician. This new story jumps wholesale into the character's mythic construction. Captain America becoming president turns a propaganda symbol into a policy-maker, and that's a shift for Marvel, even if the decisions awaiting Cap have to do with flying killer robots. Actually, a bit closer to reality than we might like to think. 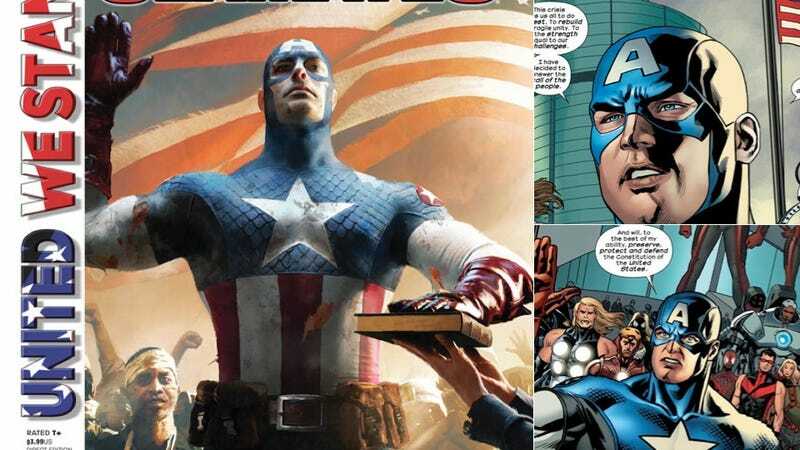 There's no question that Cap will do "the right thing" as President, but if the United We Stand event really wants to succeed, it should make the patriotic superhero face allegories for the tough choices that a real-world Chief Executive would have to make.